Even for a junior in high school, experience is everything. Mid-Pacific Institute’s Davis Lee made the most of his second shot at the Hawaii Tourism Authority’s Pro-Junior Challenge on Tuesday, January 8, finessing a wedge to seven feet of the hole in a chip-off. Lee’s wonderful wedge gave he and Canadian pro Roger Sloan the championship of the 17th annual exhibition, held during Sony Open in Hawaii tournament week. 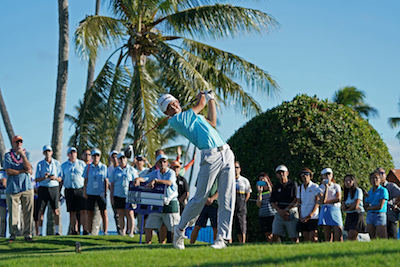 They finished the three-hole alternate-shot format tied at 1-under par with Hawaii Baptist sophomore Noah Koshi and his pro, 2012 Sony Open champ Johnson Wagner. The juniors “chipped off” for first in front of Waialae Country Club’s rebuilt 18th green, from what used to be a bunker. It would be a difficult shot under normal circumstances. With spectators, cameras and role models present, the degree of difficulty went up exponentially. Lee, the only golfer among the five juniors who had played in the Pro-Junior event before, was ice. He remembered all the times he had pulled the shot off in the past and simply trusted himself. It was a lesson the five PGA TOUR pros — Wagner and Sloane were joined by defending Sony Open champ Patton Kizzire, World Golf Hall of Famer Davis Love III and Kentucky’s Josh Teater — wanted their juniors to understand. They worked, and played, hard to give them moments and advice to remember, along with the $10,000 they helped the Hawaii State Junior Golf Association raise. Teater spoke low and slow in his Kentucky accent to `Iolani’s Kyung Eun Lee. She and Koshi were the only sophomores in the field, and the 2018 HSJGA Players of the Year. “We were having fun,” Teater said, “that’s all we were doing.” After a nervous start, his soothing words helped Lee learn that too.